Like myriad other products whose brand name is synonymous with any product regardless of manufacturer (think Band-Aid, Xerox, White-Out or Q-tip), Formica is the common name for a broad category of laminate materials. These materials are often adhered to a substrate such as plywood, particle board or MDF. Formica is composed of several layers of special paper that is impregnated with phenolic resins and heated under pressure. In a sense, the construction of Formica parallels that of plywood. In truth, plywood construction probably mimics Formica; Formica was developed several decades ahead of plywood. First developed over a hundred years ago, 1912, as an alternate electrical insulator, Formica takes its name from its intended use. Mica was used for electrical insulation and the purpose for the development of Formica was its use as an insulator “for-mica”, which is where this material, and the many others like it, take their name. Formica products are smooth and hard. They typically comprise around seven layers of paper and resin which results in an overall thickness of approximately 1/16th of an inch (1–2 mm) after the application of heat and pressure to activate the resin. The resulting product, in addition to being smooth and hard, resists heat, acidic and basic spills, dents, dings, scratches and other abrasions. For industrial applications, like a restaurant kitchen for example, a very thin metal strip might be inserted into these layers to improve heat resistance. Initially, Formica products lacked color, variety in their appearance or type of finish (gloss, matte or some hybrid of the two). Once phenolic resins, the same ones used for melamine production, were incorporated as the binding medium, it ushered in an ability to alter the color, texture and finish with a decorative color and/or pattern as the top layer. This top decorative layer was typically a kraft paper and allowed for almost limitless patterns. Obviously, a material that’s only a couple of millimeters thick isn’t terribly strong. Formica products need a strong substrate to confer additional strength to allow use in home or industrial applications. Formica products are now commonly used as the exterior layer for countertops, melamine sheets and laminated wood products like Pergo. With the myriad uses for these Formica type products, they also come with some challenges for the DIY type at home. The biggest challenge is cutting Formica topped materials. The biggest problem with cutting Formica is its tendency to chip. If you use a dull blade or saw, or if you cut Formica going away from you without adequate support, it will chip badly. This leaves an ugly, ragged edge to the top layer that homeowners and contractors despise. So how do you get around this undesirable outcome? Part of it depends on what you use to cut Formica; part of it also depends on how you cut it. The good news is that you don’t have to break the bank or blow your budget to purchase fancy tools to cut laminate (Formica) products properly. You do, however, need to make sure you cut them properly with the tools you DO have. The good news is that you can cut laminate products with a jigsaw, perhaps the least expensive option on the market today. But that’s about the only benefit associated with using a jigsaw. Even if you use a fine blade and support the laminate on both sides, you still run the risk of chipping. However, if you have a router to go with that jigsaw, you can produce a smooth finish between your laminate and your substrate. Jigsaws CAN cut Formica/laminates without needing a cleanup pass from a router. However, it does help to have a router to make a cleanup pass. If you don’t have a router to clean the edges, you can produce a smooth edge if you take a couple of precautionary steps prior to cutting. Like cutting plywood, preventing chipping is a primary concern when you cut laminates. There are several techniques that are useful for cutting both materials. The most effective technique for preventing chipping is to score the surface of the laminate with a very sharp utility knife or hobby knife, like an X-acto knife or any other utility knife. Scoring the surface helps to prevent the chipping of the surface layer by proactively cutting it prior to using a jigsaw or other cutting utensil. Despite their thin nature, laminates still tend to chip, even if you score the surface. That’s due to the nature of the laminate layers. Those seven layers packed into a 1–2 mm thickness require an extremely deep score to prevent the layers underneath from chipping the top layers. Too often, scoring the surface with a dull knife, or one that’s not surgically sharp, results in a cut that’s not deep enough to prevent chipping. Taping the line you wish to cut in combination with scoring the line can also help prevent chipping. Placing a piece of tape (painters tape or even masking tape) will provide a modicum of protection from chipping as it provides some backing to the laminate. The key to scoring a line in Formica is the precision of the score. Even if it isn’t deep enough, if you place some tape on the line, that second line of defense will help your project come out the way you want it. That said, you need to ensure that the line you score is perfect. Use a straight edge and a clamp if the cutline is linear to ensure that you make a perfect score in your laminate. If you use this method, you can make multiple passes in the Formica to ensure that not only is the score deep enough, but it is also precisely along the line you wish to cut. 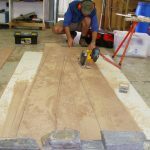 Another method to ensure that the cut line comes out straight and unchipped is to use a backerboard. Placing a sacrificial board or plywood sheet on top of the laminate you wish to cut provides much more support for the laminate, both on the top and the bottom, so that the cut comes out incredibly smooth. It goes without saying that you still need a sharp blade, regardless of your cutting choice, but support both on top and bottom of the laminate will cover for a less that sharp cutting blade. Can this be done? Absolutely. In truth, it’s a pretty straightforward process and hard to mess up…though some folks still do. Don’t be those folks. So how do you glue Formica to a substrate (we will assume the substrate is simple plywood). Contact cement…but you have to do it right. Most people aren’t patient enough or they don’t properly roll out the air bubbles. Others cut the substrate to the same dimensions as the substrate they want to attach the laminate to. Both of these approaches lead to disaster. Don’t do either. All kidding about the beer aside (wait until you’re done for the day for the beer, then have two), it’s pretty simple. Pour some contact cement over both surfaces—the laminate and the substrate and spread a thin coat over the ENTIRETY of each surface. This is important! You need to make sure that every square centimeter (square millimeter or square inch…doesn’t matter!) is covered in a thin layer of the contact cement. Once you’ve successfully rolled out a thin layer of contact cement onto each surface, you need to wait. Follow the manufacturer’s directions to the letter. Normally, you need to let it sit for approximately a half hour for it to set up. This is the time when you may want that beer. Wait for the beer and wait for the contact cement to set up….Once it has set up, it becomes slightly tacky to the touch. At this point, you can attach the laminate to the substrate. Warning!! Bring your A-game to this task!! Once the two surfaces come into contact with each other, nothing on heaven or earth can separate them. They are bound…period…full stop. So be careful. This is why you need to cut the laminate slightly larger than the substrate. Minor deviations from perfectly mating these surfaces to each other will result in exposed substrate. This undesirable outcome is easily avoided with an oversized laminate. However…once you connect the substrate and the laminate together, you need to ensure that you get rid of any air bubbles that may form between the laminate and the substrate. A simple J-roller does this while maintaining a permanent contact between laminate and substrate. Do this as soon as you attach the substrate to the laminate. Once the laminate dries, which does NOT take long, you can trim the excess laminate flush with the substrate. There are several tools you can use for this…do NOT use a jigsaw. You really should use a router, a trim router is best for this task. As an added bonus, a trim router is the least expensive member of the router family, as is the bit necessary for trimming. A simple flush trimming bit works wonders and produces a perfect finish. These are the ways of the foolish. 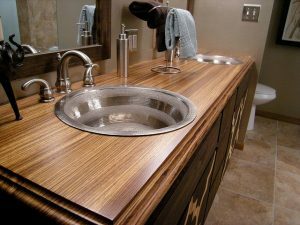 Can you glue laminate upon laminate? Yes. But why? Your countertops are bolted into the cabinets below and the substrate of the countertop is most likely particle board. Economically speaking, you’d be far better off to just head to the home center and find a new countertop to attach to the cabinets below. Many countertops also have a drip edge. This drip edge prevents liquids spilled on the counter from spilling onto the floor. These edges also rise up by about 3–5 mm (1/8th to 3/16th of an inch) above the rest of the counter surface. Trying to glue a second layer of laminate over this edge and onto the facing below is challenging for the typical DIY’er and rarely results in a professional looking finish. Just get a new countertop from the home center. NEVER consider painting a laminate floor you’ve already installed or was installed before you. Do NOT look at your laminate (Pergo) floor and imagine that it will look better if you paint it. This is lunacy. Your feet/boots/shoes will scuff the paint right off of that surface and expose the surface underneath within days…weeks if you’re lucky. Short story long… don’t paint your laminate floors or countertops. Formica products have been a blessing for homes all over the world for over a century. They have improved the look, value and function of these homes. Cutting these products isn’t impossible, but cutting them perfectly for home showing is challenging, but readily overcome with proper DIY technique. Painting laminate products isn’t a wise idea; though they can be painted, the benefits of doing so do not outweigh the negatives.